Like to add a flavor to your vacation in Darjeeling by adding a day trek in the agenda? Excellent! If you do not have several days time to go on a trek, then a day trek is ideal to get essence of some fascinating Himalayan trekking trails in Darjeeling area. 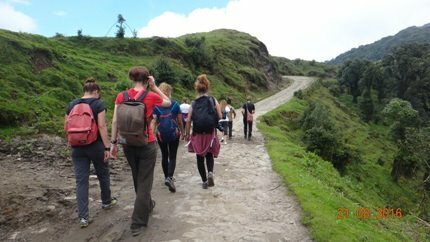 There are operators in Darjeeling who offer complete packages for such day hikes along with guides. You will drive down to a small village called Dhotrey via Manebhanjan. Dhotrey is located at an altitude of 8,500ft. It takes about 2.5 hours to reach Dhotrey from Darjeeling by car via Manebhanjan and the road is quite okay. The operator provides breakfast here. From here the uphill trekking trail starts and leads to Tonglu through dense forest and Rhododendrons. It's a 6kms trek and takes about 3 hours. Tonglu is located at an altitude of 10,130ft. On a clear day, you get magnificent view of Kanchenjunga snow peaks from Tonglu. And if you are lucky, you can even see Mt. Everest. There is a GTA operated trekkers hut in Tonglu. Being on the Sandakphu trekking trail, many trekkers to Sandakphu stay at Tonglu overnight before starting the trek again next day in the morning. From Tonglu you will head towards Tumling which is further 2kms away and located at an altitude of 9,600ft. This is where you take lunch. Tumling too offers wonderful views of Kanchenjunga. From Tumling it's all downhill trek towards Chitrey. You will pass by small villages along the way like Meghma (about 4kms from Tumling) and Lamhaydhura (further 3kms). Your final destination is Chitrey which is further 3kms downhill. At Chitrey the car will be waiting for you to return to Darjeeling. However before returning, you can take some refreshment at the eatery in Chitrey located on an open field with nice views of the meadows. Visit Trek Route to understand the trek circuit, altitude of the places and distances. Although the entire trek route is about 18kms, being a descend all the way from Tonglu, it's not difficult. If you start from Darjeeling at 6am, you can begin the trek at 7am from Dhotrey after breakfast, and return to Darjeeling by around 6pm. This is a variation of the previous trek and traces a part of the trail to Sandakphu. You will be transferred to Tonglu via Manebhanjan by a jeep early in the morning which will take about 3 hours from Darjeeling. Manebhanjan is about 26kms from Darjeeling and Tonglu further 11kms from Manebhanjan. You should start the trek by 9am from Tonglu which is at an altitude of 10,130ft. The good part of this trek is, there is no high gradient uphill or very steep trail to trek. You will take the trail from Tonglu and trek towards Tumling, a small village at an altitude of 9,600ft. Both Tonglu and Tumling offer excellent opportunity to view the Kanchenjunga snow peaks. Since you are reaching Tonglu and starting the trek in the morning itself, chances of such views are higher. In the afternoon the peaks tend to get covered with cloud. Tonglu to Tumling is a 2kms trek on a relatively flat terrain and going downhill towards the end. From Tumling you will come down to the hamlet Meghma (4kms), and then to Chitrey (6kms). From Tonglu, the total trek circuit will be about 12kms which should take about 4.5 hours of leisure hike. At Chitrey the vehicle will be waiting for you to take you back to Darjeeling via Manebhanjan (about 2 hours drive). Visit Trek Route Map to see the trek circuit. 1) You can take the Tenzing Norgay road (also known as Toong Soong road) from the Chowrasta Mall area. The road which is free of motor traffic, leads through villages of Toong Soong and Aloobari. The gradient is easy on this stretch. The route goes by tea gardens and Aloobari Monastery, and finally meets with the Hill Cart Road at Jore Bungalow. From Chowrasta to this point is about 5.4kms. From here, Tiger Hill is a 5km ascend up to the top and takes about 2.5 hours to trek uphill. 2) The other route is to take the Gandhi road and continue through its extension. It goes via a forest area and you can see lots of rhododendrons on the way. They bloom in different colors during March and April. As you walk along, you can see the Hill Cart road at a distance from several points of Gandhi Road. Finally the two roads meet at Ghoom area (6.5kms) where the ascend to Tiger Hill starts. One way total trek distance is about 11kms from Darjeeling town center to the peak of Tiger hill (along Tenzing Norgay road). On your way back, hike down to Ghoom/ Jore Bungalow and then instead of walking back, you can take a shared jeep to Darjeeling town. You should go through a good trek operator for Tonglu and Tumling day treks. They will arrange for the transport (drop and pick up services), guide and plan the entire trek including food and tea breaks. 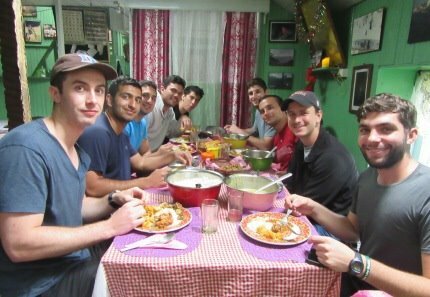 Check out Best Trek Operators in Darjeeling for their contact info and other details. However Tiger Hill day trek does not require any operator or guide, and you can easily do it yourself. There is no shared jeep to Dhotrey. You need to change few times to reach Manebhanjan (via Ghum or Mirik) and then take a reserved car from there. Planning a hike to Tonglu on the same day is not a good idea. Thank you sir for your kind and valuable reply to my previous question. I just have one another question, we two students are planning to trek to tiger hill via ghoom. Sir, my question is,if we take a public transport upto ghoom railway station via shared Jeep or train, and from ghoom rly station, we start the trek via senchal road to tiger hill,and return same way, how is the idea sir? And approx how much time will it take to reach tiger hill by walk from ghoom rly station via senchal road sir? From Ghum railway station it takes about 2.5 - 3 hours hike to reach up to the observatory tower of Tiger Hill. Right now sitting on tiger hill with high rainfall and fog and of course almost zero visibility, I am very much happy to inform you that me and my wife did the trek from Darjeeling to Tiger Hill through the Gandhi road. The scenic beauty cant be described in words, it took 4.30 hrs to complete the journey. Both of us are too happy and almost spellbound. We are deeply thankful to you for your reference.